GoPro’s got some terrible news, and conveniently, it comes as polling places around the country are starting to close. The company just announced it is recalling about 2,500 units of its new drone—the Karma—after discovering that the units were losing power during operation. No injuries or property damage have been reported, according to a statement released by the company. Owners of the Karma drone can return their units directly to GoPro, or to the place of purchase, for a full refund. Replacement units are not being offered at this time. GoPro says it plans to resume shipments of the Karma as soon as the issue is resolved, however, the company did not give a timetable for when it expects to fix the problem. The announcement comes, conveniently, as most Americans have focused their attention on the results of the US election. Results of US voting states were being reported when GoPro issued its announcement at approximately 6:30PM ET. The unexpected recall of the new product also comes in the wake of an abysmal third-quarter earnings report that caused the company to lose $250 million in a matter of minutes. Prior to the earnings report, investors were anxiously awaiting the company’s projected fourth-quarter sales, hoping they might be boosted by the launch of the company’s highly anticipated drone and the new Hero5 action camera. The Karma was seen as a way for GoPro to bring in a new source of revenue, but that clearly won’t be happening any time soon. GoPro was set to go head-to-head with DJI, another popular drone maker which also recently announced the Mavic Pro, a foldable drone with a camera made for use by amateur pilots and hobbyists. 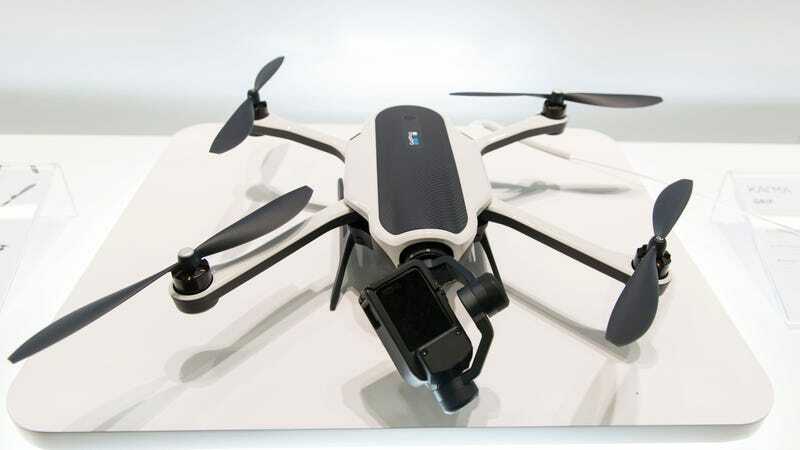 DJI was hit with its own drama after releasing its competitor to the GoPro Drone. DJI’s new Mavic Pro has been plagued by shipping delays, and according to emails from the company obtained by Gizmodo, it had been encouraging resellers to remain calm and to attempt to dissuade customers from cancelling their orders. If you were waiting for the anticipated release of portable, collapsable, video-shooting drones, it looks like you’re going to have to wait a lot longer.